This page is so you can order the Bio Bidet BB 1000 in 220/240V. 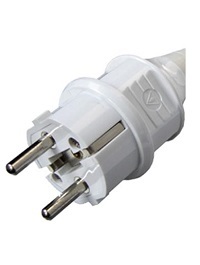 Cord is two-prong like image below. I tried one out in Hawaii and had to have one, so when i got back home to Australia i searched the net and found Bidet Plus. Within an hour I had bought one, within 10 days I received the article by courier and installed it that night. I sit behind a desk all day, a little bit handy,but definately not a tradie, but this was so easy to install. A great product from a great supplier.